The Lisbon Elementary Handbell Ensemble is a select ensemble comprised of 11, fifth grade students. Students rehearse once a week and have additional performance opportunities. Students have the opportunity to audition for this ensemble at the end of 4th grade. This year rehearsals will be on Friday afternoons from 1:00-2:00. The ensemble performs in the winter and spring concerts with the chorus. A special thank you to all of the parents and families who donated money to our program and to the Howard County Music Office. We were in need of repairs for our handbells! 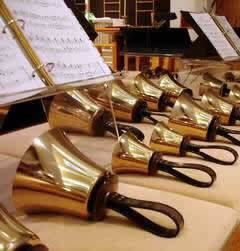 We were able to replace many of the accessories for our handbells and also get all 3 octaves restored and refurbished! I am looking forward to many more years of ringing!